PastPorte - Hurley's Camera for Dulwich College. 2014-17 marks the centenary of Ernest Shackleton’s epic attempt to be the first to cross the Antarctic Continent. Dulwich College, which houses a permanent exhibition dedicated to its former pupil, wanted an exciting exhibit to mark the event. We were inspired by the photographs and film shot by Frank Hurley, expedition photographer, and so we dreamt up a way to use them to transport visitors to the Antarctic ice to join Shackleton’s crew during one of the key events of the doomed expedition. We used Hurley’s images, combined with an original drama we wrote and recorded in 3D audio, to transport visitors into the hold of The Endurance on 18th October 1915, the day the ice floes crushing the ship pitched it up and out of the water. The experience was housed in an antique camera, similar to the one Hurley would have used. All the visitor had to do was to put on the headphones, put their face to the viewfinder and press play. 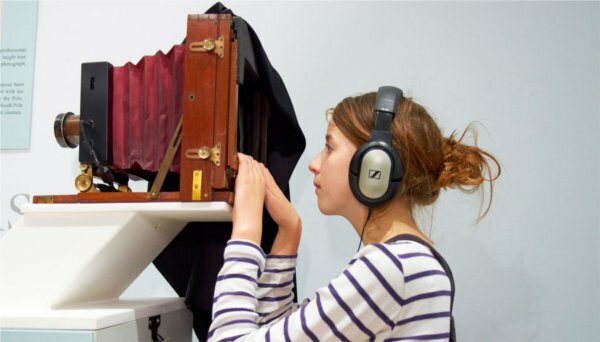 The camera is a permanent part of the exhibition and both visitors and pupils love it. You can watch the film we made above – remember to wear headphones for the full 3D impact. Call us on 01242 256970 or email ben@pastporte.co.uk if you’d like us to come up with some interactive exhibit ideas for your museum or attraction.